Hair... it's a lot of work. I never used to be much of a hair girl. All I really needed was shampoo and a brush, oh, and a head band. I did and do love a headband. My easy going hair days are long gone though. From colour, to all kinds of conditioners and styling products, hairspray (I question how I lived without it) and heat styling I have a rather high maintenance 'do. I'm sure a lot of you reading this do to. 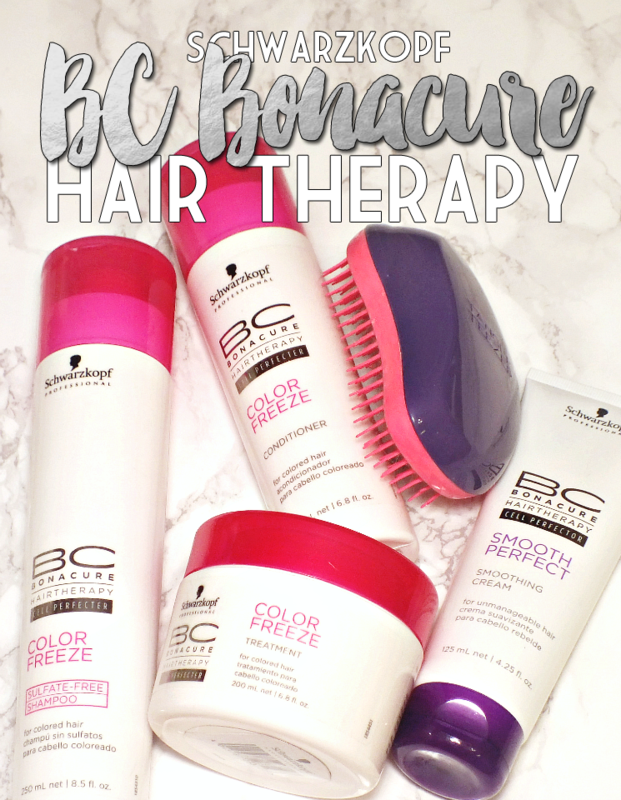 While I product hop a lot when it comes to my hair routine, my staples come from the Schwarzkopf BC Bonacure Hair Therapy range. Read on to find out why. Anyone with coloured hair knows it can be tricky to find a good shampoo that doesn't strip your colour. Sulfat-shampoos are the answer, but they're not all created equally. My hairdresser recommended the Schwarzkopf BC Bonacure Hair Therapy Colour Freeze (formerly Colour Save) Sulfate-Free shampoo and I haven't looked at much else since. The shampoo is specifically formulated to be gentle on colour treated hair and brings hair to its optimal pH 4.5 level to perfectly 'freeze color pigments' in place. The shampoo is pretty much suds-less, so I always feel like I need to use more shampoo, but this does cleanse hair well without needing a second wash. I tend usually have a semi-permanent colour in my hair, so I still experience some bleeding, but much less than I would with other shampoos. This also has a nice scent, fresh and clean but not overpowering. There is, of course, a matching conditioner. It's fine, but nothing all that exciting. I've been doing the reverse wash thing (wherein you condition first, then shampoo) and find this conditioner works well, but I do prefer the treatment (coming up next) as my ends are dryer and are recovering from a recent bleaching. I do give extra points to Schwarzkopf, as they made the conditioner bottle a bit smaller than the shampoo. Has anyone ever finished a shampoo and conditioner at the same time? I think not. The real gem is the Schwarzkopf BC Hair Therapy Colour Freeze Treatment. The creamy conditioner is formulated to both condition hair and, like all the products in the range, strengthen hair and return it to the optimal pH level to prevent colour fade. The conditioner has a rich feel but isn't overly heavy feeling. It only needs to sit on hair for a few minutes (3-5 does the trick) and leaves hair super smooth, less frizzy, and perfectly shiny. I especially love this treatment for use on freshly dyed and bleached hair, as it gives back the moisture that was stripped during the process. 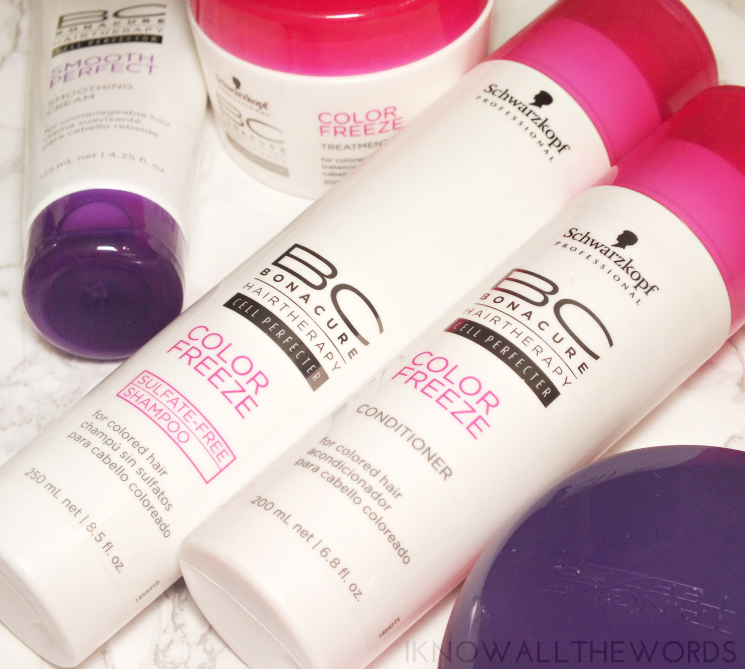 The Schwarzkopf BC Bonacure family consists of six ranges designed for all types of hair. Colour Freeze being for colour treated hair and Smooth Perfect being for coarse, thick, wavy, curly, unmanageable hair. Other than wavy, my hair is none of those things, but I did give the Smooth Perfect Smoothing Cream a test because that's just what I do. 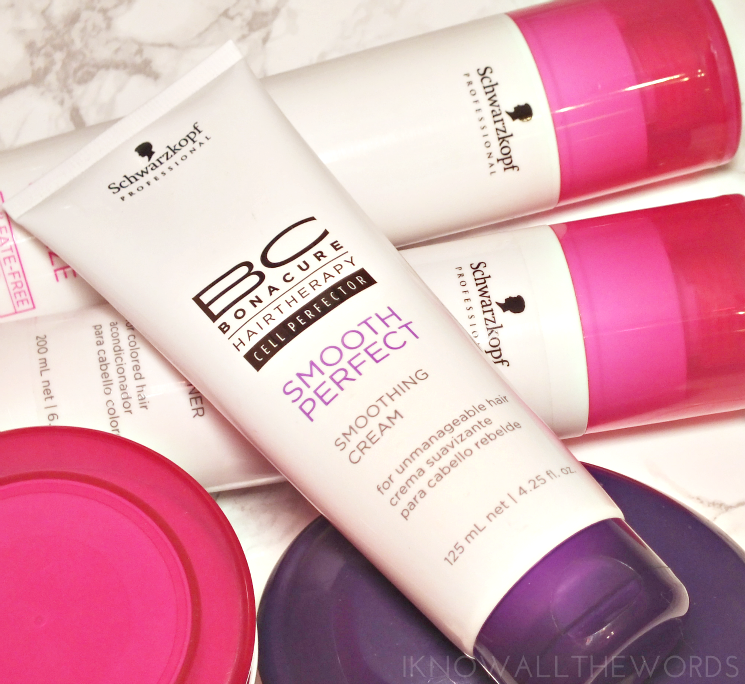 The Smoothing Cream is a thick, balm like cream that works to smooth hair and protect it from heat. I was worried the formula would be too heavy for my finer hair texture, so focused on the ends of my hair where it tends to be drier and frizzier when first washed. I let my hair air dry to see if the cream would make much of a difference on my hair texture, and was very pleased that it really does leave my hair a lot smoother and silkier. While I need very little product, the cream works very nicely to smooth my hair on the days I don't do any heat styling. 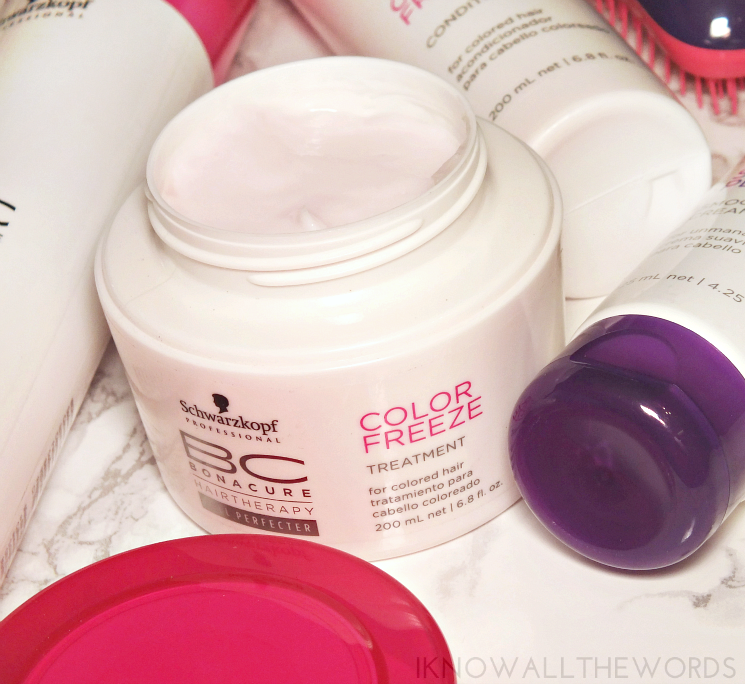 Overall, I'm a big fan of the Schwarzkopf BC Bonacure range. The Colour Freeze shampoo is a must for me (I get the massive bottle from my stylist) as it helps keep my colour where I want it- in my hair and not down the drain. Have you tried any products from this range? What is your go to hair product?